COMMENT & ANALYSIS: They might have different reasons than us, but businesses objecting to a cycle route in Naas, Co Kildare, are correct — a planned cycle route in Naas should not be built, or at least not to its current design (EDITED, see note below). Often we’d take issue with this type of stuff, but the cycle route in question — the Kilcullen Road cycle route — is not worth fighting for unless its design can be improved. O’Meara is correct, the route will not do much to encourage cycling. Maybe more to the point it will not do enough. 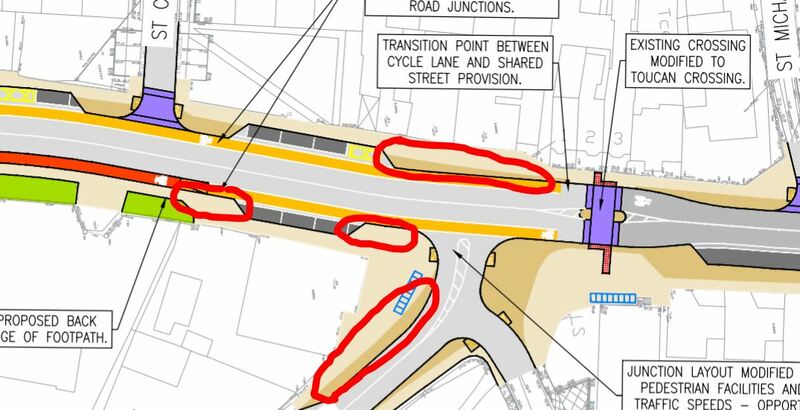 It could easily be a continuous cycle route but instead the council and NTA have opted for a route which goes from walking and cycling shared on footpaths to cycle tracks to cycle lane and then shared a surface with heavy traffic in the town centre. This design is not suitable for children or most would-be cyclists because it mixes cycling with heavy traffic and it will also annoy walkers and cyclists who don’t want to be mixed on footpaths. Parking spaces is a bit of a red herring. The number of parking spaces around the two shops in question — Larry Swan and Pat Goulding — could easily be doubled or more without any major affect on the project. As shown on the right of the above image, the design towards the town centre mixes cycling and heavy traffic. Then the main side road here (Ballymore Rd) is to be narrowed but no provision is being made for space for cycling — this is important because cycle routes alone don’t get many people cycling. You need cycle networks for that. An alternative would be to link the cycle route on the Kilcullen Road directly to the paths in the Fair Green park, but that also is not done. As shown on Street View, pictured above, the section towards the town centre is actually a wide space. There’s no need for cycling and motorists to be mixed along most of this stretch of street. 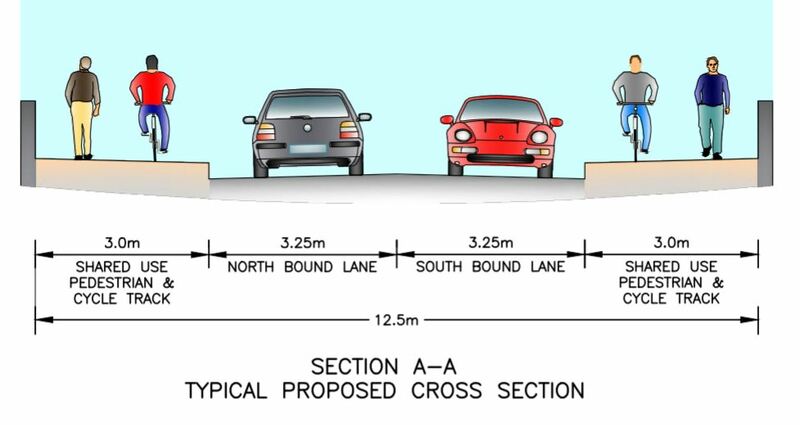 The Street View image shows a section which is around 18 metres wide — the council and NTA design makes little sense as the above shows what can be fit into the same space. Our design above shows what can fit in the space (our design, using streetmix.net). The narrowest section nearest the core of Naas town centre can fit the above (our design, using streetmix.net). Between sharing with cars and shared with footpaths the middle section of the route is the best section (Pictured is the proposed design by council). But the section outside the Garda station is between 16 and 18 metres wide, so we’re not sure what the parking was removed — at least some of it will fit even with a better level of segregation… are the Gardai committed enforcing parking law on what will be a wide footpath and cycle path? If not or if maybe, it’s best to provide parking spaces here. South of the Garda station cycling and walking are mixed on shared use footpaths (Pictured above and in the two images below is the proposed design by council). It would only require a small strip of three front gardens — by agreement or CPO — to give cycling and walking both their own space. But the south end of the project shows that giving cycling and walking their own space is not a priority for the council or the NTA who has agreed to fund this scheme — there’s ample green space which could be used. And we’re not talking about all of the space marked in green above, much of the space behind the shared path is a green bank of what seems to be council-owned land. Then on the roundabout, there’s no formal cross on the east side towards all the schools which were poorly located outside the South Ring Road. Basically: This route isn’t of a high enough quality. Towns like Naas need high-quality cycle networks and they need buy in to get these right. The start of a high-quality cycle network would not look like the above scheme. Phase one would quickly add or upgrade many kilometres of routes around the town by using Naas’ green spaces and wider roads — linking residential areas to work places and schools. It would include making crossings and junctions safer; knocking walls or fences to add to permeability; and it would focus on removing shared sections on existing routes (not adding to such). The approach of the Kilcullen Road cycle route is not worth defending, unless some large design improvements can be made. NOTE, EDITED: The end of the first paragraph was edited and the line , “or at least not to its current design” was added to the end of it. This is to reflect the view that the issue is the current design of the project. The approach of tackling this road is acceptable is the design is of high-quality, but if a low-quality design is approved, the focus and funding would be better spent on other projects first. The headline was also edited to reflect this and “its design needs to be better first” was added to the headline, and “unless some large design improvements can be made” was added to the concluding paragraph. It’s quite depressing to see schemes like this that will achieve nothing (increase in cycling by all ages) being funded by the agency (NTA) that is supposed to know it all! One has to assume that the Road Authority laid down the design parameters but one would expect the funding agency to insist on a network concept being at the core of what is proposed with cycling to schools and shops being a fundamental design objective. Who did the road safety audit for this scheme? I’m sure the business leaders of Naas would be against any cycle lane no matter how well designed it was. Perhaps this design is bad but Naas is choked by cars and could benefit hugely by even a small change in modal share. There are large numbers of houses on the periphery and the residents have two choices, they can drive through a narrow town centre packed with cars or they can drive around the ring road to an out of town shopping centre. If people felt able to cycle in to the town centre it would benefit town centre businesses directly by increasing the number of customers on bike and indirectly be relieving the traffic pressure and making it more likely that some shoppers would move from the peripheral shopping centre(s) to the town centre. This is the same short sighted thinking that pressure groups like Dublin Town engage in. It is incredible that someone can look at the main road in Naas in the evening (or any popular time), see a road choked with slow moving bumper to bumper traffic and think that the problem is there are too many cycle lanes. Seriously Can, we are working so hard to get these schemes going and have just had your article quoted to me by an anti cycling councillor. We have a public meeting tonight where by traders are trying to bully the council and councillors into rejecting this scheme. I will be standing up alone tonight advocating for mor cycling routes to be created and suffice to say they will like to string me up. I presume you know the way these schemes work. Councillors will vote to reject ,accept or amend. We have slowly persuaded the councillors to amend on a number of issues that you have highlighted. It’s such a pity that you are undermining our efforts. Your headline is going to be used against us. Just remember it is being built to allow kids to get safely to and from schools that are at either end of it. Why did you not quote the editors article and quote the ant cycling side. God help us all with our campaigns if you are our public advocate. @ Bill — Your anger should be directed at Killdare County Council for proposing such a low-quality scheme and towards the NTA for allowing such wide-spread use of poor design by their design manual and their funding of such schemes. The design proposed is not safe and attractive for all ages and abilities. A lot of money has been wasted on schemes like this one around Ireland which are not suitable as a means of growing cycling usage and making cycling safe and attractive for all ages and abilities — this website is focused on highlighting such issues and where we can try to hold people in authority to account. We’re highlighting poor design — please blame the designers and those involved in how the design was developed. I agree regarding the utter cynicism of this scheme. But it gets worse. I made a visit to Naas in January to have a look. There is already a deeply flawed scheme on the Kilcullen road south of the roundabout. This leads to the Pipers Hill campus where there is a concentration of schools. There are serious questions about the design and fitness for purpose of some of the very recent cycling provision. However the “elephant in the room” is the roundabouts on the inner relief road. Children whether on foot or on bicycles are still expected to negotiate these roundabouts to get to this site – including the roundabout in the drawings above. This alone raises questions about how planning permission was granted for schools at such a location. The National Cycle Policy Framework (NCPF) acknowledges that such roundabouts are incompatible with increasing cycling. The NCPF includes an objective for tackling such roundabouts. From the outside it seems indefensible for a town to building a cycle route in the name of children but do nothing about the roundabouts. Either those involved have no knowledge of cycling policy or are trying to evade key measures in national cycling policy. This cannot be portrayed as promoting cycling. Instead this appears to intended to abstract state funds for a “cycling scheme” while retaining roads features that make cycling impossible for the least confident. So we have schemes building facilities that will be ignored by many confident adult cyclists but do nothing to address key issues blocking less confident cyclists. Ultimately what makes this kind of thing possible is that local authorities are aware that the Department of Transport, Tourism and Sport declines to accept a supervisory role over how those authorities spend state funds. Well said, Shane. It is the master-funder (i.e. DoTTAS) that has the power to change all of the crap! A fundamental requirement for funding by DoTTAS/NTA should be the publishing of a road safety audit of all schemes that is put into the public domain and undertaken by an independent auditor who understands cycling and the 8-80 age range paradigm. Guys this a great discussion to have among ourselves as we all believe in high quality cycling infrastructure being constructed. However the political reality is that will be used against us as gerry Doran report is being used by barrow group. It just makes things much harder for us and when an anti cycling councillor shows this to you it is very difficult. We are st the forefront of this campaign and we will get relavant changes including crossings at ballymore road and on the ring road but we have to help each other. With regret Bill claiming to build a cycling route for children on the Kilcullen road but leaving in the roundabouts is little better than “false advertising”. What has been built already is not getting used by adult cyclists out on spins – there have been public complaints to that effect. While at the same time the location remains unfit for purpose for schoolchildren. So we have the worst of all situations “one-size fits nobody”. The existing Kilcullen Road scheme has already negatively impacted the public perception of cycling. If the intent was to provide for child cyclists then a quick look at Google maps shows other options were available. Instead it appears a mess has been created and the latest proposals appear to reinforce the mess. As a regular cyclist and someone in favour of high quality cycling facilities in Naas , I strongly object to your contention that Kilcullen Road is not worth fighting for. I agree that it does not do enough but that is precisely why it IS worth fighting for. As you seem to be expecting a high quality network on a plate, I would suggest that you don’t hold your breath. This is a scheme which is in essence another piece of a jigsaw. It links the residential estates to the south of the town and five schools – one secondary and four primary. I disagree with your statement that the route is not continuous. It is continuous as far as the town centre – the problem with it is that it is incoherent, unattractive and unsafe. Your criticisms about the (1) the shared paths, (2) parking at the garda station and (3) lack of infrastructure close to the town centre are correct. However, it would have been more helpful if you had made a submission on these points during the public consultation period, as Naas cyclists did and more, rather than commentating on the bad design six weeks after public consultation was over. The Kilcullen Road is a DIRECT route into town. 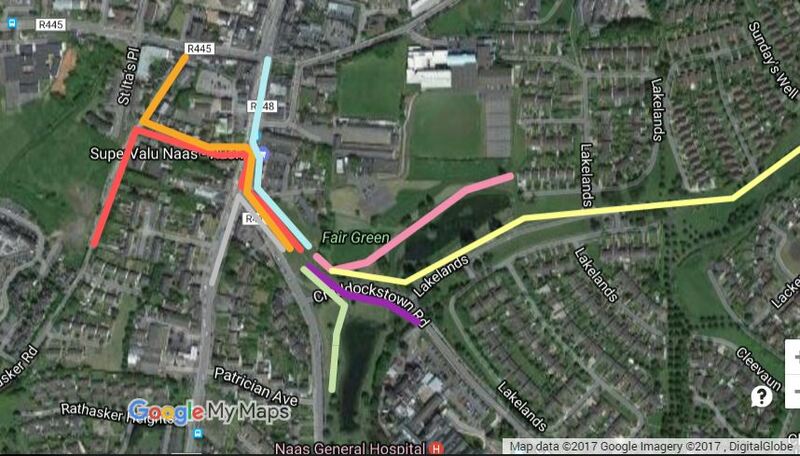 You should give credit to Kildare County Council or whoever is responsible for having the courage and vision to tackle this key route with consequential hard decisions on parking spaces rather than the more usual soft option of building low quality leisure routes which don’t affect people in cars. BTW, your suggested allocation of road space is not feasible. The 14m cross-section shown on the drawings is not the narrowest point. I am also afraid that your comment on the Ballymore Road is misleading – there are no changes proposed except at the junction and I do not understand your suggestion that Kilcullen Road should be linked to the paths in Fair Green. Why? They lead out of town! The businesses in question are concerned about accessibility of their premises. This mirrors concerns about business everywhere which overestimate the use of cars by customers and who grossly underestimate the importance of a pleasant shopping environment for people on foot. The Kilcullen Road may not be as important or cater for as many cyclists as the Clontarf Route but it is our Clontarf and although you may have given up on it, Naas cyclists will continue the good fight. I went a bit too much to the extreme on that one and I should have said it is worth fighting for if the council are willing to upgrade their design. I’ve made an edit to try to reflect this. I should have included a larger focus on segregation but generally not counting shared sections with motorists on a main road and shared with footpaths as a continuous cycle route. This website generally does not make submissions, but our timing on publishing this one could have been better. I’d find it hard to do so when the practical end point of their vision includes unnecessarily mixing cycling in main traffic flows and use of shared paths. From the junction with Ballymore Road to Corban’s Lane the typical width is ~18 metres — here you can easily fit good footpaths, cycle paths, and some parking with buffer space. From Corban’s Lane to New Row / Main Street the typical width is ~15 metres. It goes down to 14 metres and possibly as low as 13 or 12 metres. But for the 66 metres length between Corban’s Lane and New Row it’s 15+ metres wide — it’s only for around 16 metres where a compromise would have to be taken. As in the main article, the parking is a red herring. Extra parking can be provided without affecting the cycle lane or unduly affecting footpath space. If a parking protected cycle route design was used (as it should be), there’d be less space for extra parking but there would still be space for some extra parking. Good — I hope everyone who wants to make Naas a better place supports a better cycle route. But the thing about the Clontarf fight is that that campaign for improvements distances it self from the current design. Publicly saying the current design is substandard can not be mutually exclusive from wanting a cycle route — this can’t be just some hidden discourse between a small group of pro-cycling people. I’m admitting that I was wrong in some of the tone of this article, including the headline, which I will now also edit. FYI If anybody wants to use it, the code for the quoting above is quote — remove the word REMOVE for the code to work! Unfortunately the damage has been done. Your article was presented as “even cyclists are against this ” at the public meeting so quote what are you harping on about bill even your own don’t want this. Councillors are now going to a second vote on Dublin road and looking like kilcullen road will be scrapped. Thank a mil for your support. From Naas Neighbourhood greenway we officially request that you don’t comment on Naas again. I welcome the news that the council have decided to back away from this. For the record I don’t have an agenda for the Clontarf route. However I am very much a committed stakeholder for the National Cycle Policy Framework. Leinster Wheeler states of this scheme that “The Kilcullen Road is a DIRECT route into town.”. As the scheme is currently proposed this claim is unsupportable in my view. The online Oxford dictionary provides this definition of direct “By a straight route or without breaking a journey:” The presence of unchanged roundabouts makes this scheme inherently discontinuous and piecemeal. The issue of roundabouts and cyclists has been known about for years. This extract comes from a 1987 report and deals with crashes associated with roundabouts on the Swords Bypass. “4) The high incidence of two wheeler accidents on the Swords bypass allied with similar findings in the major accident study carried out by the TRRL on roundabouts shows that roundabouts on high speed roads do not provide a safe environment for two wheelers and consequently give serious reservation as to their use where high numbers of this road user class is expected”. The intended effect of this scheme was to deliver child cyclists into just such a roundabout. A likely outcome would be that children and less confident adults would end up feeling forced to get off and walk at this point. The drawings provided suggest the same assumption. It is not much fun trying to cross on foot at Irish roundabouts and it is not something I would recommend for child pedestrians either. So we have a scheme based on “get off and walk” and even then you’re doing well to cope with the situation if you are a child. So likely confident adults would simply ignore the shiny new cycle paths as a distraction that solves nothing. At the same time the parents of Naas would be entitled to the view that “this is not a suitable route for my children”. So we would end up with unused cycle paths and cyclists getting it in the neck because money has self-evidently been wasted. @ Bill — with the greatest of respect, this website will continue to cover issues on cycling across Ireland the way it sees fit within the law and within the bounds of taste and decency. I will try to not make mistakes and will try to quickly correct those I make, but I will be covering any part of Ireland in our news and comments sections and will contuine to welcome others who want to contribute. Also, re your comment earlier (“Why did you not quote the editors article”) — the editor was not quoted because our article was focused on the detailed design. But I’ve read and re-read a lot of content from the Leinster Leader on cycling — and I have to say if you’re concerned about media coverage you might focus more on their one-sided news reporting. It does not really matter if the editor writes pro-cycling stuff when the detailed news reporting is almost always negative towards cycling with little in the way of balance. I will also be writing to councillors outlining how that, while it could have been clearer, my position was twisted. I have a very low bar for cycling infrastructure. All I ask is that it not be worse than nothing. While I agree that this route could be better I DO think it is better than nothing. I realise that Cian and a few people here are convinced that complete segregation is the only acceptable solution but I do not agree at all. If you think this route being voted down will result in a better solution I think you are fooling yourselves. This is a bad result and the rhetoric used here turns out to have had a negative effect. @Hivemind — we look for standards suitable for all ages and abilities but the councillors don’t just have the option of reject, they can direct officials to modify a scheme to make it better.